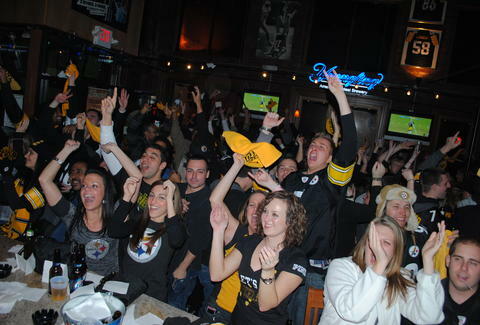 How do you define a sports bar in a sports town like Pittsburgh? Truthfully, if a bar has more than one television, it basically counts. Trying to find a spot for Steelers Sunday? Pitt football Saturday? Hockey playoffs? Bucco season? Really, no matter what game you’re trying to watch, most every bar in Pittsburgh’s got your back. Very few label themselves as “sports bars,” namely because they don’t need to -- many places (too many to count) have sports memorabilia lining the walls and regulars who could pass for 1970s Steelers statisticians. 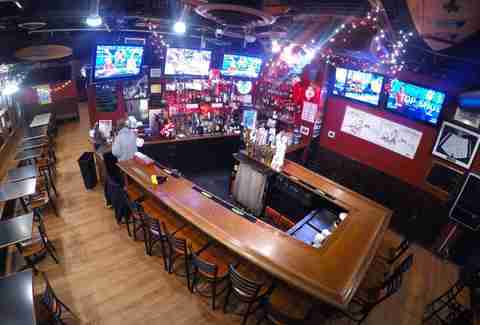 So, what are the best sports bars in Pittsburgh? The short answer: all of them. But if you’re looking for more specifics, this list should have you covered, no matter what region of the Steel City you base your fandom in. Placed right at the bottom of Cardiac Hill in Oakland, take a seat at Pub instead of climbing to a seat at the Pete -- it is not recommended to make that climb having just eaten loaded nachos. Good food choices and atmosphere bring people in (and also make them stay). 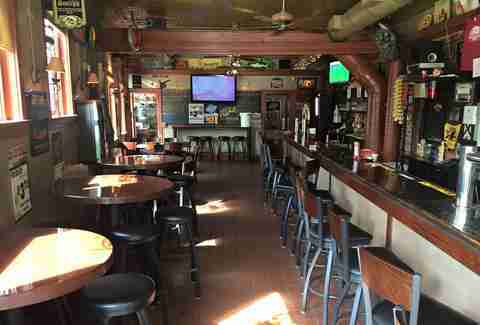 It can be hard to find a seat here, but you'll be surrounded by a feverish energy once you do. 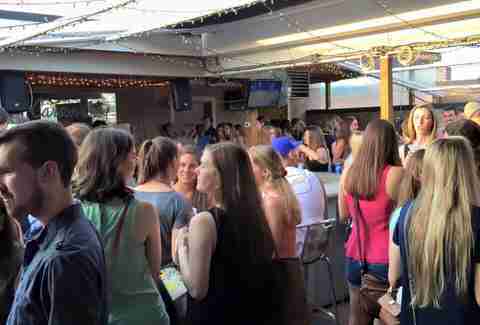 Most of Pittsburgh’s outdoor bars are on rooftops, which are excellent in their own right, but there’s something to be said for a first-floor bar that doesn't require you to hike up three flights of stairs or awkwardly ride in a cramped elevator. The William Penn has a large outdoor space (that's covered in the winter) that requires no extra legwork, so all your energy can be spent eating wings (with its famed “Kitchen Sink” sauce) and screaming at the refs. Want to go out to watch the game with a good selection of beer? Don’t want to the hassle of a big crowd? 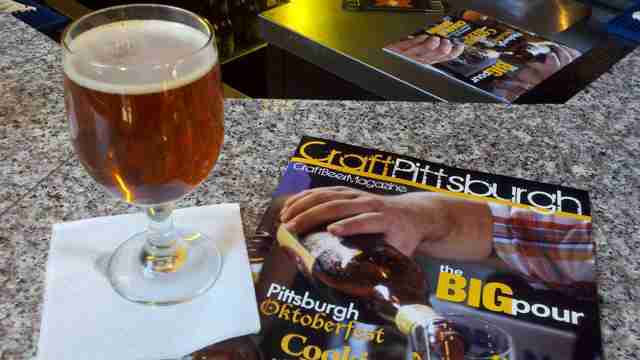 The Strip District’s BeerHive is the place for a calmer Steelers Sunday. Some might like the big crowds to cheer with, but others might want to skip the air horn in the ear every once in awhile. This bar constantly rotates its draft list and, what’s more, it actually keeps it updated on the website. Small plates, like Pittsburgh Pickle Company deep fried pickles, will serve you well on game day. The tavern’s building has stood the test of time, by design. The bar has merged the classic with the updated look and feel of the place, and added on a lengthy list of pours. Not to mention its award-winning wings and salads that are actually salads and not the sad pile of leaves some other bars might try and pass off as salad. This tavern has a great second-floor space, but is available for private party reservation, which can make the bottom floor a skosh too tight sometimes. There’s a bar that has Iceburgh’s likeness in its logo, and it just so happens to be located across the street from PPG Paints Arena. As you walk up to The Souper Bowl, you'll hear the Pens’ announcers, giving you that pre-game hype up. Busy before and after the game, the divey space becomes the eye of the storm during regulation time for those who don’t have seats inside the arena. Sit right in front of a TV, grab what’s on special, and sink your teeth into some wings with a sauce option that mixes BBQ and buffalo (Hint: It’s waayy more buffalo). Where can you get an Immaculate Margarita? 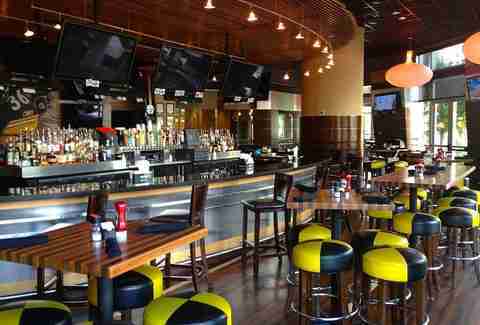 The Bettis Grille. The Bus’s stop is located on the North Shore, just footsteps away from Heinz Field and PNC Park. More like an mid-to-upscale restaurant instead of a bar, a few extra dollars is worth the price of space, good food, and strong drinks. An obvious leap across the pond in the middle of the Steel City, Piper’s might more commonly be a game-day hangout for those with a love of soccer, with the Beautiful Game memorabilia lining the walls instead of American football. However, the pub food and drink selection is good on any type of game day, and really, nothing should come between a sports fan and their bangers and mash. The only thing that’s more Pittsburgh than going to Primanti's is going there to watch a game. Any of the locations throughout the city provide a truly yinzer atmosphere to watch whatever is on, coleslaw and all. If you’re lucky, the chain might have the HBK sandwich available (created near the end of the championship 2015-16 season to honor Penguins players Carl Hagelin, Nick Bonino, and Phil Kessel, not “The Heartbreak Kid” Shawn Michaels), which stacks bacon and kielbasa on top of ham and is only available in limited releases. Carson City is probably the ultimate bar stop for someone looking to cheer and yell at various large screens with a crowd of likeminded people. The South Side spot’s walls are lined with memorabilia, including the likes of a Jaromir Jagr jersey that’s been altered to say “Jagoff” and “traitor” -- you know, the type of wall hangs that give you all the warm and fuzzies as a Pittsburgher. A large draft list and a few bucket options make this place a great spot to take an Uber home from regardless of your budget, and the food menu touts Pittsburgh favorites, many of the portions big enough for two -- prepare your belly accordingly or plan to share with a friend. The atmosphere is loud, enthusiastic, and contagious, much like Pittsburgh itself. Brandy Hadden knows the best thing about a Pittsburgh win is watching it with your friends from the comfort of a bar stool. What’s your favorite sports bar? Tell her @BrandyHadden!